Northern Herd Development co-operative was established at Cohuna, Northern Victoria, in 1974. Forty years later the co-operative now trades as National Herd Development to better reflect NHD's growing area of service provision. 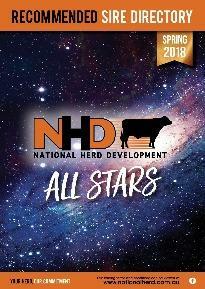 National Herd Development provides Dairy Herd testing and artificial breeding services throughout Northern Victoria, Riverina (NSW), Western Districts Victoria and throughout all of South Australia. Agents for Red River cattle yards and crushes.